Clients are often getting quotes from a few different vendors. Following up with a message and/or phone call helps set you apart from your competition and allows you to answer any questions the client may have about your quote, services, or past experiences. Fun Fact: Almost 40% of bookings on GigMasters are confirmed within 48 hours of a gig request being submitted. Make sure you're responding quickly and following up with your clients! While you want to allow a little time to pass between submitting your price quote and following up with the client, don't wait too long! You want to give the client a chance to read and digest your quote but you don't want to let anyone else to swoop in and win over the client. We recommend messaging and/or calling the client 24-48 hours after you submit your quote. We've seen this time frame work best with our members. Go to the Leads tab of your Control Panel. Find and click on the gig request you submitted a quote for. You'll then be brought to a page with the 'Event Info' and 'Client Info.' Here you'll see the client's email address and phone number are listed, along with an option to message the client right through GigMasters. Go right ahead and follow up! Following up with a phone call to the client typically works best because it allows you to more quickly answer any immediate questions the client has and also gives them a better glimpse into your personality and professionalism. However, do what makes you feel most comfortable. The more comfortable you are with the communication the better you will be at expressing yourself and your genuine interest. Be conscious of their needs. 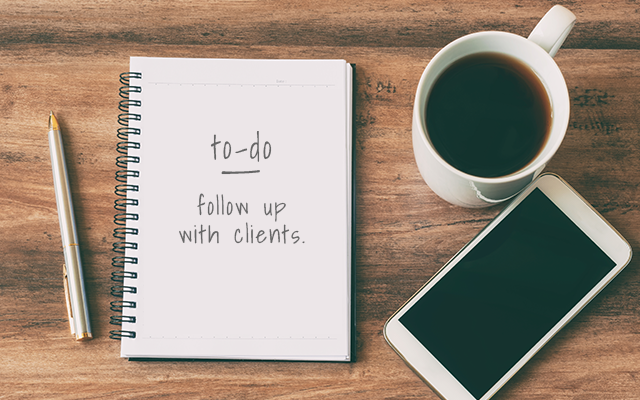 If you get the client on the phone, start the conversation by introducing yourself and asking if it's a good time to chat about their event. If it isn't, ask them when would be a good time to call back or give them your contact information so they can reach out to you. If you're following up via email, keep it brief and don't repeat what you already included in your quote - reiterate only your most important points and add anything you might have left out. Ask them when they would be available for a brief phone call so you can learn more about their event. Ask questions. See if they've had time to review your response and have any questions. Also, be sure to ask about their event so they know you are interested in providing the best service possible. Be personal and professional! Don't be shy - let your personality and professionalism shine and let the client know why YOU would be a perfect fit for their special event! The take-home message from all of this: You shouldn't consider following up as optional. If you do it right, reaching out to potential clients after submitting a price quote can seal the deal and get you booked. "Within less than an hour after submitting my request through GigMasters, I began receiving replies from vendors. The first person to respond via phone (instead of email) got my business. They were professional, timely, and worked with the budget I had. I'll definitely use them again when I have another event."